Upgrade to upper deck cabins are available. 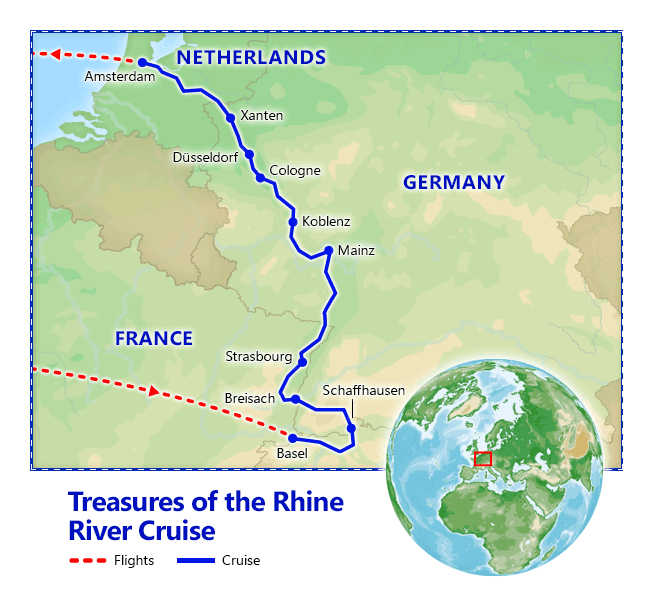 Experience a journey through four countries in the heart of Europe, on a stunning Rhine River cruise starting in Basel and ending in Amsterdam. Dine on superb French cuisine paired with an unlimited selection of wine and beer. Take part in daily shore excursions to visit the picturesque cities of Basel, Strasbourg, Mainz and the Gutenberg Museum, Amsterdam and more. After dinner, relax with musical entertainment, a Gala evening, or venture into the quaint towns for an evening stroll. Accommodations: 8 nights on board MS Douce France. Included meals: Dinner. Arrive in Basel, be met and transferred to your river cruise ship for boarding at 6:00 pm. Full Day Itinerary: Arrive at Basel Airport, where you will be met and transferred to the port. Luggage can be stored as of noon, and check-in will be at 6:00 pm. After settling into your cabin, get to know the crew over a welcome cocktail and dinner on board. Full Day Itinerary: This morning, travel by coach to the city center for a guided walking tour of Basel. 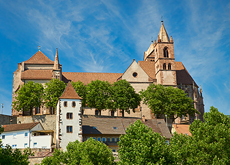 Discover the longstanding Grossbasel section with its numerous medieval monuments and passageways. 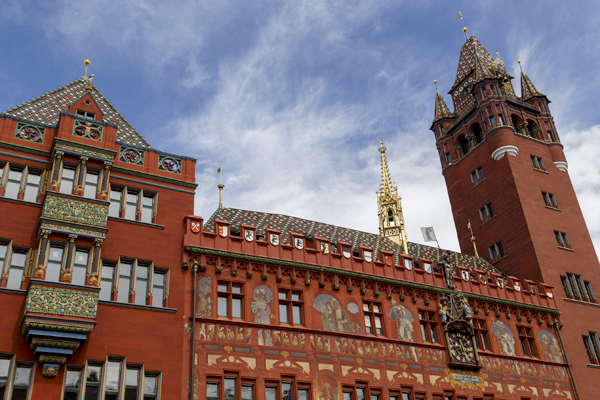 See the Basler Münster, the Protestant cathedral and one of Basel’s most important landmarks. 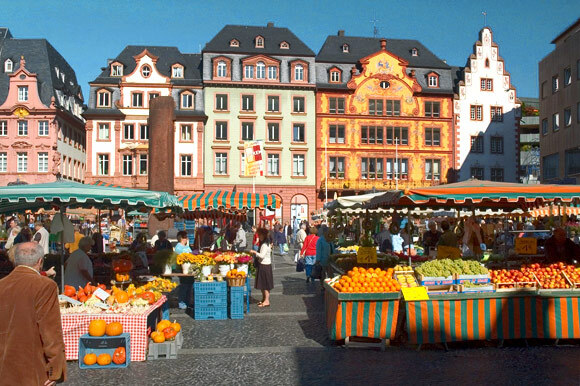 The market place is dominated by the ornate Town Hall. Stroll along the well-known Feie Strasse, a main transit route during the Middle Ages and today a trendy shopping area. Return to the ship for lunch. In the afternoon, set off by coach to see the Rhine Falls, one of the most spectacular sites in Switzerland. View the Laufen Castle, which boasts an impressive view point over the falls. Return to the ship for dinner and dancing, as you cruise towards Breisach. Full Day Itinerary: Enjoy a free morning in Breisach. 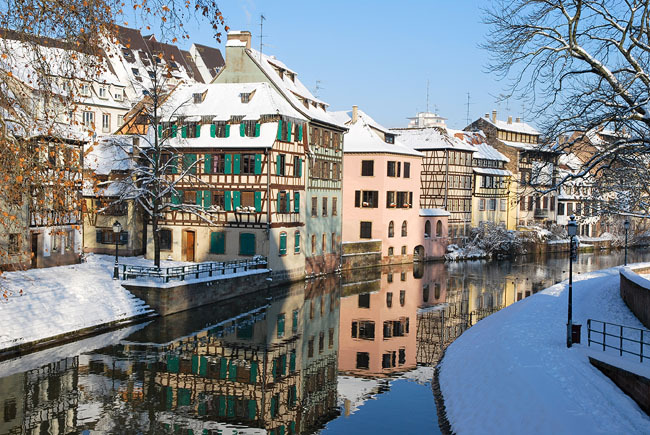 After lunch on board, depart for Colmar, with its typical and authentic Alsatian architecture of brightly painted timber façades dating from the Middle Ages, and discover the quintessential neighborhood of “Little Venice”. Visit the Unterlinden Museum featuring a large collection of local and international artworks and artifacts from prehistoric to contemporary times, as well as the Isenheim Altarpiece. The museum is housed in a 13th century Dominican convent, which in 1906 was also a public bath. Return to the ship for dinner and entertainment. 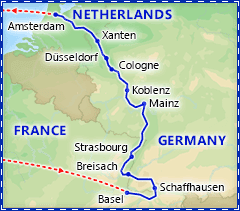 Full Day Itinerary: Relax on board as you cruise toward Strasbourg. After lunch, depart for a guided visit of Strasbourg. Begin with a panoramic tour of the town, driving through many of its districts, such as the “German Quarter”, past the Place de La République, continue to the European district, passing by the Palace of Europe, the Human Rights Building and the European Parliament Building. Continue exploring this European capital during a guided walking tour around the Cathedral where you will view the façade of the famous Kammerzell house. 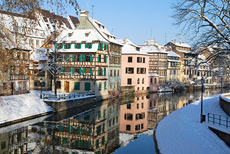 Then, amble along in the Petit France District, a famous district in Strasbourg much loved by the locals and listed as a UNESCO World Heritage Site. Return to the ship later this afternoon for an evening of dancing as you sail toward Mainz. 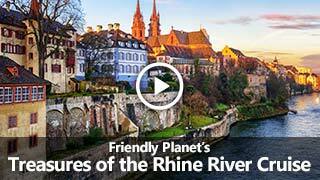 Full Day Itinerary: After breakfast, set off on foot with your guide to visit the town of Mainz, capital of the Rhine Palatinate and founded more than 2000 years ago by the Romans. Mainz is situated on the banks of the Rhine River opposite the confluence of the Rhine and Main Rivers. Admire the magnificent historic houses which date to 17th and 18th centuries. Enter the cathedral, where construction began in 975, and houses historical treasures including tombs and funerary monuments. Wander up and down the colorful streets of the old town. Visit the Gutenberg Museum, spread over five floors. Johannes Gensfleisch Gutenberg himself prepared the copy of the Bible referred as “the 42-line Bible” published in 1455 and is the oldest printed book in the world, and houses one of the 46 remaining copies in existence. Also see the “Mainz Psalter” the first document ever printed using three ink colors. Board the coach to rejoin the ship at Worms. Cruise towards Koblenz, passing by the legendary Lorelei rock. After dinner on board, join your cruise director for a casual walk in Koblenz. Full Day Itinerary: Enjoy the morning as the ship cruises to Cologne. After lunch, depart on foot with your guide. Cologne or Köln, has been at the crossroads of Europe since the Middle Ages, and is still a vibrant and important commercial and industrial city as well as a cultural and religious center. 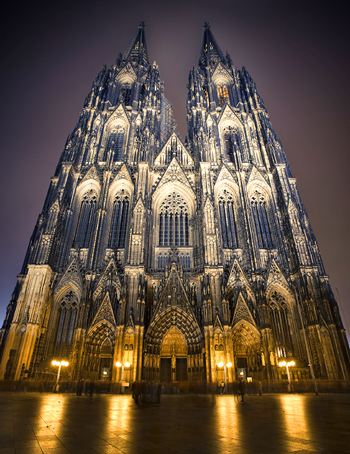 Admire the exterior facades of the high Gothic Köln Cathedral, built over the course of five centuries, and finally completed in 1863 and for a short time was the tallest building in the world. The cathedral is surrounded by 12 Romanesque style churches representing the 12 apostles. Walk through the Old Town and admire the new-Gothic building, home of the famous “Eau de Cologne”. There will be some free time in town, and then continue by coach to meet the ship in Dusseldorf. Gala Dinner and music on board. 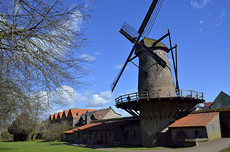 There are many buildings, farms, windmills, workshops, a school, a church and other structures. There are demonstrations inside each building. See the HollandRama on the lower level, with its panoramic theatre, films, sounds, lights that evoke many different landscapes, from city panoramas to the inside of houses. Return by coach to meet the ship in Nijmegen. Cruise toward Amsterdam in the afternoon, This evening, entertainment on board after dinner. Full Day Itinerary: After breakfast, depart by coach for a guided tour of the unique city of Amsterdam, from its romantic canals to its world-renowned museums and historical significance. Stop to view the De Rieker Windmill, one of the eight windmills in the greater Amsterdam area. Originally built in 1636 in the town of Sloten to help drain water, it was dismantled and rebuilt 1961 on the banks of the Amstel River between Kalfeslaan and Borcht. 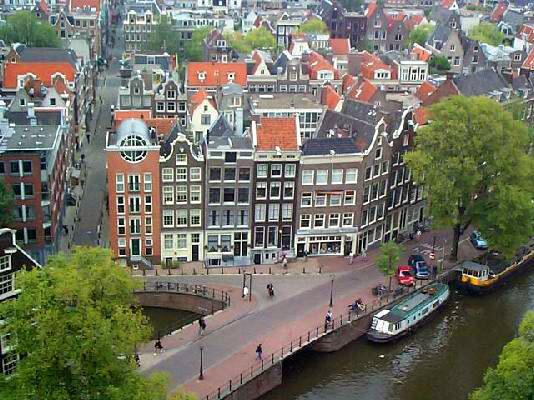 Rembrandt drew inspiration from these sites and a statue of him was erected nearby. Then, head to the Diamond District for a diamond cutting demonstration and an explanation of how diamonds are valued. There will be some free time to browse the shop. Drive by the Bloemenmarkt, the famous floating flower market, and the most fragrant place in Amsterdam. Return to the ship by coach. After lunch on board, depart this afternoon for Haarlem, known as the “City of Flowers” and for centuries the main production and export center for tulip bulbs. This charming town has been the inspiration for painters and artists throughout the centuries. See the Amsterdamse Poort (Amsterdam Gate) built in 1400 and the only remnant of the city’s fortifications; The Grote Markt (Main Square); the Corrie Ten Boom House used as a hiding place during World War II and the impressive Gothic Cathedral of St Bavo. 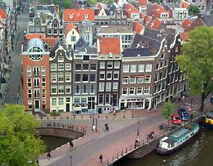 After some free time, return to Amsterdam by coach. Enjoy a final dinner on board this evening. CroisiEurope’s MS Douce France is a superior first class cruise ship. It is spacious, and bright with a passenger capacity of 110 with 55 cabins. Once on board, you will find all of the amenities and comforts which distinguish CroisiEurope’s fleet, and the outstanding and friendly service which is the trademark of the staff and crew. CroisiEurope’s cruises always start with a welcoming cocktail reception, where you’ll meet the captain, crew and staff of your boat. What should I know about Switzerland? Check out our guide for travel tips, the best time to go, blog posts, videos, and more. What should I know about Germany? Check out our guide for travel tips, the best time to go, blog posts, videos, and more. What should I know about Netherlands? Check out our guide for travel tips, the best time to go, blog posts, videos, and more.